Napa High's Vince O'Kelley is fouled by Sonoma Valley's Nicolas Spanger (30) in a VVAL Tournament opener Wednesday night. Napa High guard Brayden Greenlee holds the ball in the final seconds of a 56-42 win over visiting Sonoma Valley in a VVAL Tournament opener Wednesday night. Napa High's Logan Van Zandt (21) drives against Sonoma Valley center Brendan Hogan on Wednesday night. Napa High guard Brock Bowers (22) earns a foul while making a 2-pointer over Sonoma Valley center Trent Garrett in a VVAL Tournament opener Wednesday night. Napa High guard Tyler Oda (13) brings the ball upcourt, defended closely by Sonoma Valley forward Nicolas Spanger, in a VVAL Tournament opener Wednesday night at Messner Gym. Sonoma Valley guard Reed Hewitt (2) drives baseline against Napa High guard Zach Swim in a VVAL Tournament opener Wednesday night at Messner Gym. Napa High guard Vince O'Kelley drives baseline against Sonoma Valley's Justin Cox in a VVAL Tournament opener Wednesday night at Messner Gym. Napa High's Vince O'Kelley (23) is fouled by Sonoma Valley's Nicolas Spanger (30) in a VVAL Tournament opener Wednesday night. The Napa High boys basketball team extended its winning streak to 15 and booked a spot in the Vine Valley Athletic League Tournament final Wednesday night with a 56-42 home win over Sonoma Valley at Messner Gym. Although the final score was decided by 14 points, earning a win in the third installment of this matchup proved to be a much taller task than the Grizzlies’ previous wins over the Dragons, 57-43 on Jan. 7 and 60-42 on Jan. 18. “It’s tough to beat anyone three times – especially Sonoma,” Napa head coach Zack Cook said. “(Sonoma Valley head coach) Mike Boles is really good at film study and putting together game plans as a tactician. Boles coached at Justin-Siena for 16 seasons – most notably the varsity girls for 12 seasons from 2002-14, when they were a combined 259-91 with 12 North Coast Section playoff appearances, five Marin County Athletic League regular-season championships, two MCAL tournament titles, and a section title. Napa (22-5, 13-0 VVAL) struggled early on, going scoreless for the first 4:30 of play as they put up just as many points as turnovers (six) through the first quarter of play. “We didn’t play our best, or nearly as well as we could,” said Napa sophomore Brock Bowers. “We just needed to calm down, make shots and pass the ball. We were making a bunch of dumb passes trying to push it too hard. With Sonoma Valley (16-11, 6-7 VVAL) ahead 9-6 at the end of the first quarter, the Grizzlies turned to hot-shooting sixth man Brayden Greenlee for a spark. 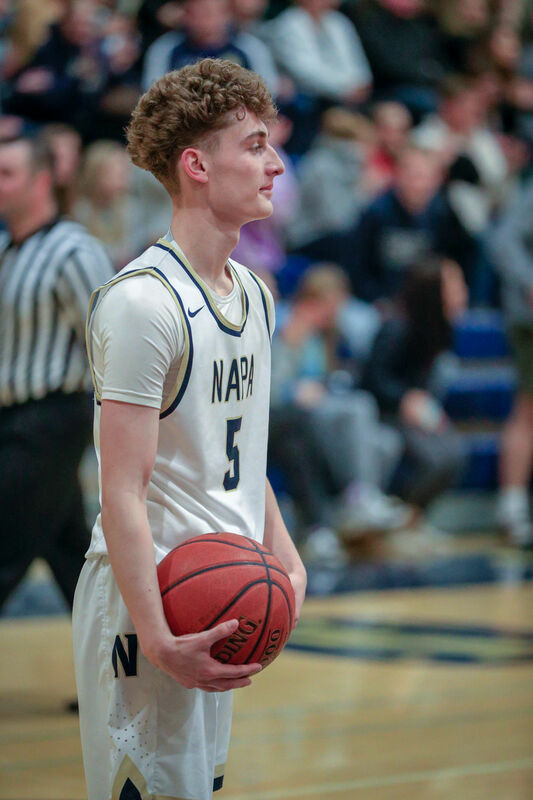 The sophomore guard pulled through for his squad and rang up 10 second-quarter points, allowing Napa to regain the lead at 22-19 heading into halftime. Greenlee led the way in scoring for his team with 15 points while chipping in four rebounds, four steals and two assists. Although Greenlee had awoken his team from its first-quarter lull, the Dragons came out of the locker room firing in the second half and recaptured the lead, 24-22, at the six-minute mark. But just when Sonoma Valley seemed to fully seize the momentum, a clutch three from senior Stephen Blume (11 points, five boards) gave Napa the lead right back. Though Blume’s swish from deep put the Grizzlies up by only a slim 25-24 margin, they would never trail the rest of the way. Helping secure that lead was Bowers, who came on strong with six of his 11 points in the fourth quarter. With fellow frontcourt partner Zach Swim (four points, three boards, two assists) in constant foul trouble and experiencing an off night, Bowers did all he could lead his team as it outpaced the Dragons 34-19 in the second half. In addition to his point total, Bowers led his team as a distributor with four assists and pulled down an eye-popping 14 rebounds despite being keyed on by multiple defenders on every possession. With the win, Napa is now an astonishing 15-0 on its home court this season. Though the Grizzlies are the No. 1 seed in the VVAL tournament, they’ll have to travel to No. 2 seed American Canyon on Friday night for the VVAL Championship. American Canyon was to be the host of both the boys and girls finals, whether the Wolves were in them or not, and will actually wear their visiting uniforms with Napa wearing its home colors.